Big Ted stows away on his Family's Big Adventure touring Europe. Big Ted.. BIGGER ships and new friends! 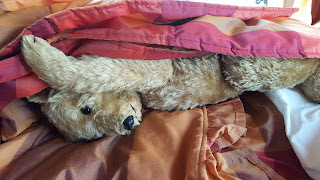 Big Ted hugged himself with joy, he really was so pleased he was not in a box in storage ... he still did not know what storage was, but he DID know that it would never ever EVER be as much fun as travelling in The Motorhome with his family and Saxon, the big hairy thing that wasn't quite a bear. 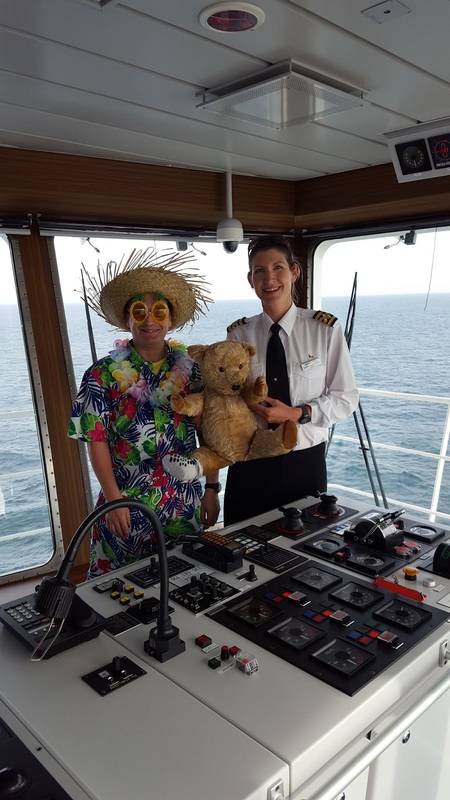 Big Ted really enjoyed his time on the ferry ship and he was a bit sad to say goodbye to Captain Louise and Alex, but he was pleased to get back into The Motorhome again and be back on the road. Big Ted was in FRANCE! 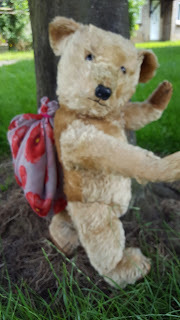 He liked the look of France, it was very green and there were lots of trees and forests... Big Ted knew that bears lived in forests in some countries, he wondered if France had bears, he hoped so. Soon they got to their next stop and Big Ted was very pleased to see they were near water again, it was a RIVER!! Big Ted had seen rivers when he was looking at the maps, this one was the river Seine. 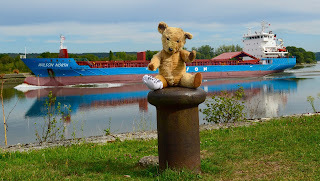 Big Ted sat and watched the fish jump, the ducks swim by, and the cargo ships...... CARGO SHIPS ?????? Big Ted did not know that Cargo ships sailed on RIVERS!!! he almost fell off of his seat in excitement! Big Ted sat and watched the activity on the river for hours, he was SO happy. Later, a new motorhome came and parked next to them and a voice asked if he could sit with him and watch the ships too, Big Ted turned round and almost fell off his seat when he saw...... ANOTHER BEAR!!!! This bear was called George and he was older than Big Ted, he was travelling around Europe with his owners too! George and Big Ted sat and watched the river (and had a bottle of Normandy cider between them) and a new friendship was made. Big Ted did not think it could get any better than this. 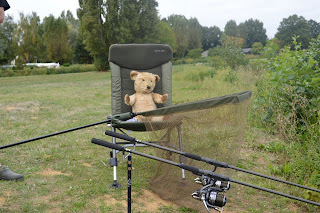 The next morning Big Ted woke up with a headache, that was a new feeling for him, he did not like it, he did not like it at all.. he spent the day relaxing by the river fishing. George Bear did not come out to play at all. His owner said he was 'resting his eyes'. 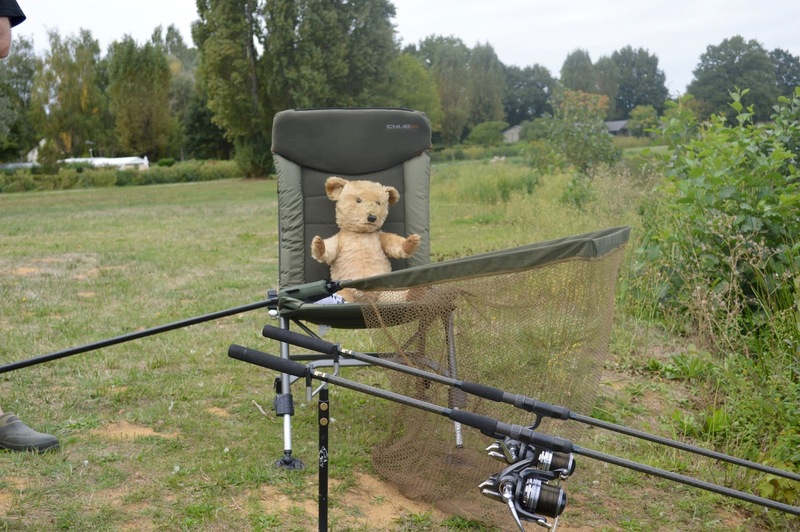 Big Ted caught two tiny fish, he set them free in the river again, he did not feel very hungry for some reason, and he did not think he would be drinking cider again! Big Ted discovers his Nautical side. Big Ted never knew there was so much to learn, in the last few weeks he has discovered cars, countries, places, motorhomes, and now SHIPS !!! well, that is a bit of an exaggeration really, he has been on a FERRY... not just any ferry, but a P&O ferry across the English Channel! 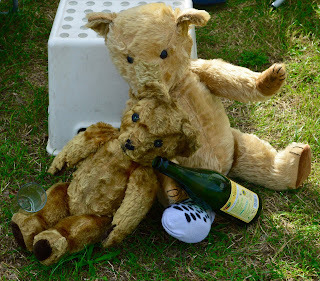 Poor Saxon, the hairy, not quite a bear thing had to stay in the motorhome, but Big Ted was invited to go to the Club Lounge with his owners, Big Ted was very excited.... VERY excited indeed! Once the SHIP ( so much grander sounding than a ferry!) 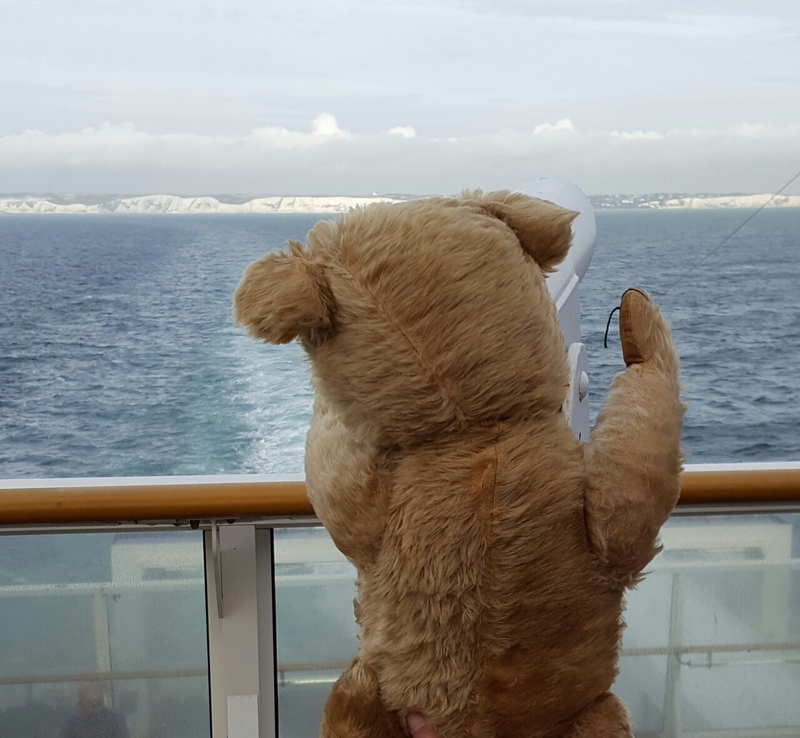 left Dover, Big Ted was allowed to go outside on the deck - Big Ted was learning a whole load of new words too! He looked through the telescope and waved goodbye to England and shouted ' See you in March' he hoped Sophie and William heard him, he did shout in his loudest bear growl. Bye Bye England, see you in March! It was a bit blowy out on the deck so Big Ted went back inside for a cup of tea and a marmite sandwich. A very colourfully dressed man called Alex bought his breakfast, and he told Big Ted that the Captain of the ship had heard all about Ted's Adventure, and she would like to meet him! Big Ted was surprised that the Captain was allowed come to the Club Lounge, who would drive the ship? He was was even more surprised when Alex said that The Captain had invited Big Ted up to 'The Bridge' to meet her! Apparently 'The Bridge' is where The Captain drives the Ship, and you have to be very important to be allowed up there! Big Ted smoothed his fur and made sure he looked his very best ( even with his poorly paw) and off he went with Alex. 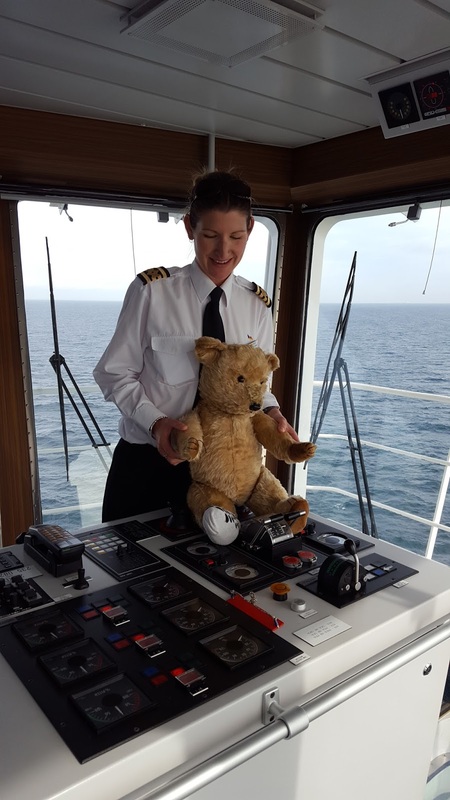 Captain Louise lets Big Ted steer! Captain Louise Steer was very pretty, Big Ted was all tongue tied and didn't know what to say! She told Big Ted that he was a very handsome bear (for his age) and she wanted a few photos taken with him, Big Ted didn't mind, he put his best paw forward! and stole a cuddle or two! Captain Louise even let him steer the ship for a while too, Big Ted enjoyed that very much, he didn't mention that he thought you drove a ship, like you drove a car! All too soon Big Ted had to go back to his owners as they were going to be docking in France, and he had MORE friends to make, and MORE adventures to discover... he hoped they involve ships.. he likes them, very much... VERY much indeed !!! Big Ted was quite comfortable in his hiding place in The Motorhome, he was warm and dry, and he had found some VERY interesting reading material...... MAPS!! Big Ted knew all about maps, they showed you PLACES.... Big TED was not quite sure what places were, but he did know that some places were warm and some were cold. He also knew that his owners were going to take Sophie and William to some FUN places on holiday. Big Ted wanted to go to FUN places too, he wanted.. but wait!! what was that noise.... OH NO !!! someone was coming.. OH HECK no time to hide..
BIG TED WAS RUMBLED !! Everyone was surprised to see Big Ted in The Motorhome. 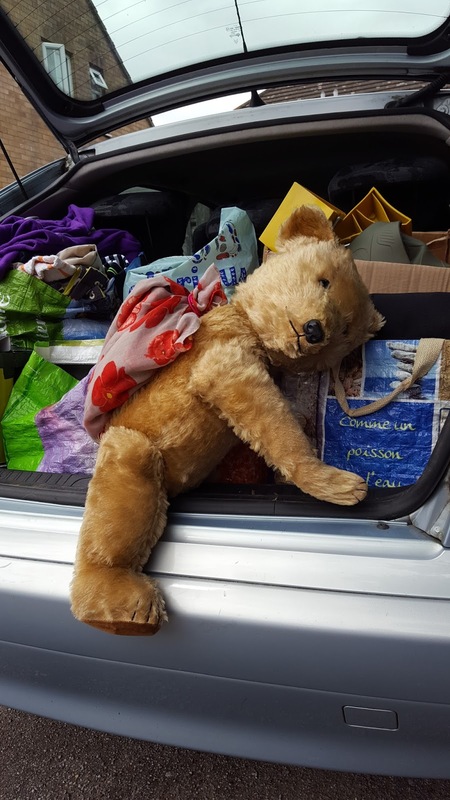 and Big Ted was delighted to find that no-one was angry with him for stowing away, he was going on an adventure too! 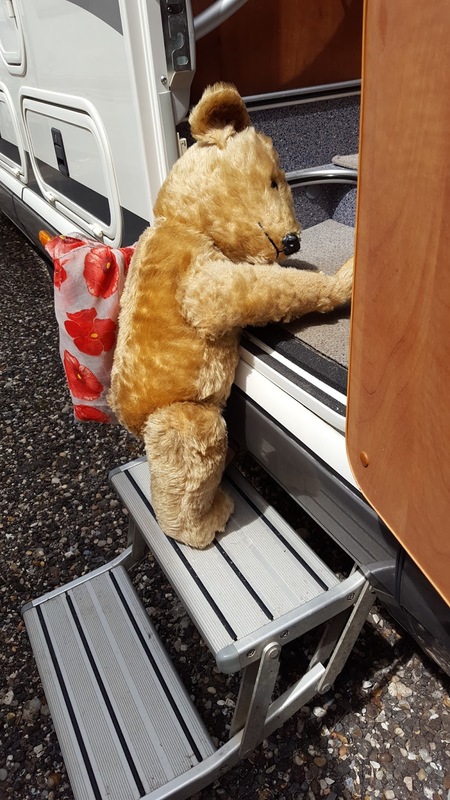 Big Ted discovered that The Motorhome was like a huge car with really comfy sofas, a kitchen, a shower AND two huge beds in it, it was like a house on wheels! Big Ted loved looking out of the window and watching the scenery go by. He was looking forward to meeting new people and making new friends. The first place Big Ted visited was a huge surprise to him, it was a whole new COUNTRY !! Well... he was only just over the border at Carter Bar... Big Ted did not expect that, not without going on a boat, or a plane, he was surprised, because it just happened while driving along the road, they pulled in, got out, and one minute they were walking in England.. (photo with mum to prove it) the next they were in Scotland! Big Ted wanted his photo taken again to PROVE he was in Scotland, so he asked a wee Scottish boy called Kane to help him ( Big Ted is too small to stand on his own) Kane was happy to help, but he didn't smile... it isn't cool to smile while holding Big Ted you know! Big Ted has decided he wants to see more of Scotland, that is a trip for next year! Whilst looking at the maps Big Ted spotted an island called Lindisfarne, he thought he would like to go there because his owner (mum) is called Lyndis too! So.... back they went to The Motorhome and they headed North-East for 46 miles.. Big Ted WAS have fun exploring PLACES ! Big Ted was speechless... he thought he was old at 54!!! but what he learnt on Lindisfarne, also known as Holy Island, amazed him. There were ruins of a priory that was founded in 635AD !!! and a Holy Man named St Cuthbert lived and died there! Part of the ruin was an amazing archway known as the Rainbow arch.... Big Ted thinks it should be renamed The Big Ted Arch... what do you think? Big Ted also watched a live play which was a reenactment of the history of the priory and he was honoured to be invited to take a role in Act 4 scene 3. Big Ted thinks he may have a future as a Thespian! And he liked the after scene hugs too! Big Ted put all his possessions in his back pack (a furbrush and a torch) and he waited until his owners were not looking and he crept out of the house and into the back of the car where all The Motorhome boxes were being stowed, nobody saw him! nobody heard him! 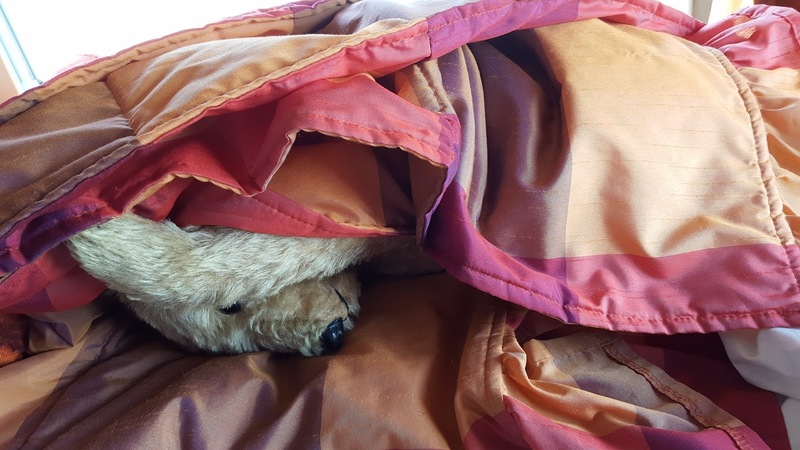 He quite liked being where he was, he wondered if this was The Motorhome, it smelt of Saxon, the big hairy thing that wasn't quite a bear, he lived in the same house as Big Ted. Soon he saw his owners taking boxes out again and putting them into something VERY big.... this must be The Motorhome, Big Ted thought, so he very carefully climbed out, and waited until no-one was looking and quickly went up the steps and looked for somewhere to hide.